While trying to think of wintery themes and things to write on, I asked twitter what they thought a good theme would be. @BodyWontBreak said "Motivation: how do you find it? how you keep it? how do you motivate others? or maybe forging your own path?" I let my mind wander on this one. I started thinking about I'm very lucky to know some super awesome people online and in person and how they have motivated me. They do biathlons, triathlons, 5ks, 10ks, 10m, half marathons, marathons, ultramarathons, and Ironmans. They're really badass. Because I see them do all sorts of awesome things (1) I want to do awesome things and (2) because they succeed, I know I can too. But the one thing I've come to realize about all of these people, and especially the people who have come into athleticism late in life, is that they know they cannot do it alone. While they might be the only one who can run the race, they depend on the support of their trainers, their support crew, and their friends and family. I also started thinking about what @BodyWontBreak said about forging your own path. While I think each person's individual journey is specific to that person, I don't think we're reinventing the wheel each time. We see how a balanced diet + exercise + sleep + honesty --> weightloss/healthgain. It's not a huge mystery to the people who have given up all the fad diets and easy fixes. We realize the path we've been trying to avoid (the long, hard road) is the path we need to take. 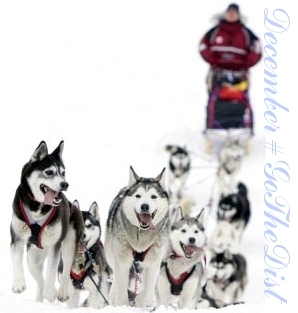 Enter the Iditarod: the race where your team carries you the whole distance of 1049 miles over a span of 9-15 days. Though you don't have 4 legs and a tail, you are still part of the pack. The pack depends on your specific skill set and expertise (i.e. navigation and being able to distribute food) to get the whole team across the finish line. Though the trail never changes, the conditions are never the same. The motivation for the dogs goes right to their breed -- huskies and malamutes were bred for their strength, their stamina, their disposition, and mostly their desire to run. They are amazing athletes in their own right (for example, The average Alaskan husky running in the Iditarod burns about 11,000 calories a day. To put that in perspective, compare a 44-pound dog with a 175- to 180-pound human in an endurance event like the (Tour de France) bicycle race. On a body-weight basis, an Iditarod racer eats and burns about eight times as much as a Tour de France cyclist. ), but when working with the right set of other dogs, they are a precision team. Lead dogs, swing dogs, team dogs. and wheel dogs need to work together, but are chosen to fit certain roles. I don't know what the motivation for the human is, because the prize money pales to the cost of maintaining the team. But I'm willing to bet it is the same for many other athletes -- to push the boundaries of what they know or think they can do, and then go further; to say they are among the elite. How are you specifically qualified on any given day to be an agent of change not only in your life, but in the life of someone who might be looking to you for motivation, support, or mentoring (whether you even realize they need you or not)? 2. Fill out the next available line on the "Summary" spreadsheet (do not use Columns F or G, J or K -- they will automatically calculate once link your sheet). I repeat.... START ON THE SUMMARY PAGE! 3. **CREATE YOUR INDIVIDUAL PAGE** (Look at the line you filled out on the SUMMARY PAGE -- find the corresponding number on the bottom of the screen. This is your individual page!). I'm also quite happy to see how #GoTheDist and #MeFirst can work hand-in-hand. Consider taking the #MeFirst pledge! Also, check out the #MeFirst Blog! Can you apply what you've learned in ##GoTheDist somewhere else in your life? I need me some inspiring today so must.read.archives.